The main difference between MySQL and PostgreSQL is that MySQL is an open source RDBMS while PostgreSQL is an open source ORDBMS. DBMS is an application that helps to store and manage data efficiently. RDBMS is a DBMS that is based on the relation model. MySQL is an RDBMS. Moreover, ORDBMS is another type of DBMS. It is based on the relational model and the object-oriented database model. PostgreSQL is an ORDBMS. Both these are widely used in enterprise applications. MySQL is an RDBMS. It is free and open source under the terms of GNU General Public License. It is also available under different proprietary licenses. Google, Facebook, Twitter, YouTube, etc. also use MySQL. It is also used with various programming languages such as PHP, Python, Perl, C++, Java, etc. It works well with large data sets. Moreover, most database-driven web applications such as WordPress, Drupal, and Joomla also use MySQL. MySQL stores data in tables. Primary key and other keys such as foreign keys help to establish relationships between the tables. The developer can create databases, delete databases, create tables, alter tables and delete tables using MySQL. He can also use the SQL language to create indexes, views, and stored procedures, etc. Overall, MySQL is an easy-to-use, secure and flexible DBMS. 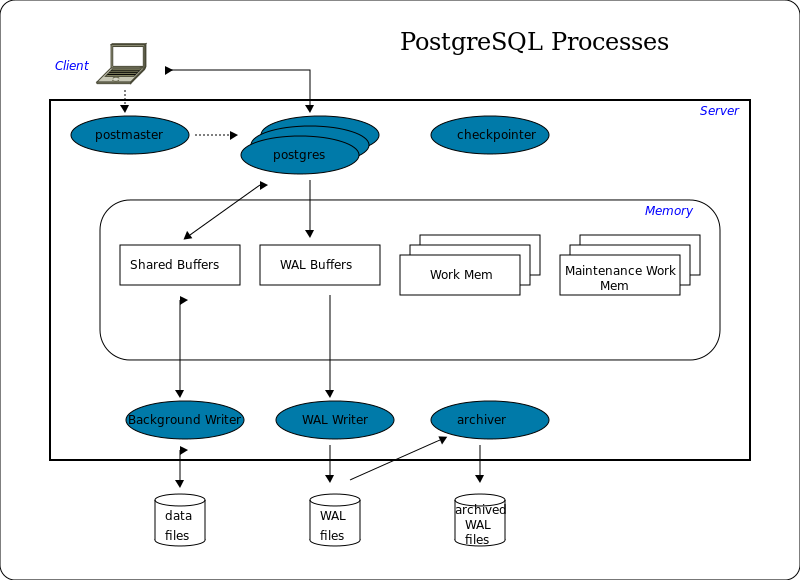 PostgreSQL or Postgres is a DBMS based on the Open Source Object Relational Database Management System (ORDBMS). It is a free and open source under PostgreSQL license and supports small single machine based applications as well as large applications such as warehouses. It also allows multiple users to access the databases simultaneously. In other words, it supports concurrent users. PostgreSQL is based on the relational model as well as the object oriented database model. Therefore, we can consider it as an ORDBMS as well as an RDBMS because all ORDBMSs are also RDBMSs. Using PostgreSQL, developers can create complex SQL queries to perform transactions, create views, triggers, etc. Additionally, it can be integrated with programming languages such as C++, Java, Python, and Perl. Overall, it is a reliable, useful and accurate DBMS. 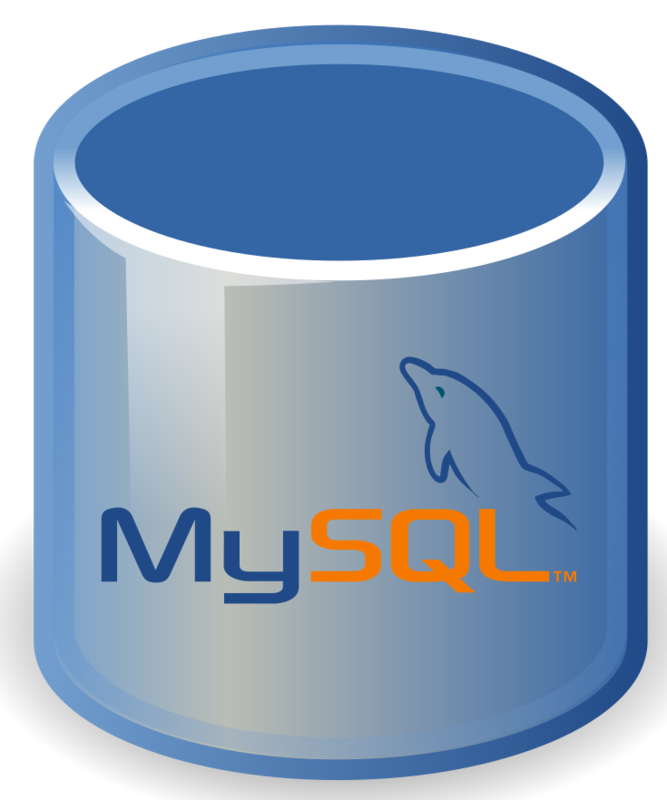 MySQL is an open source Relational Database Management system (RDBMS). PostgreSQL, on the other hand, is an open source Object Relational Database Management System (ORDBMS) with an emphasis on extensibility and standards compliance. Thus, this is the main difference between MySQL and PostgreSQL. Oracle Corporation developed MySQL while PostgreSQL Global Development Group developed PostgreSQL. 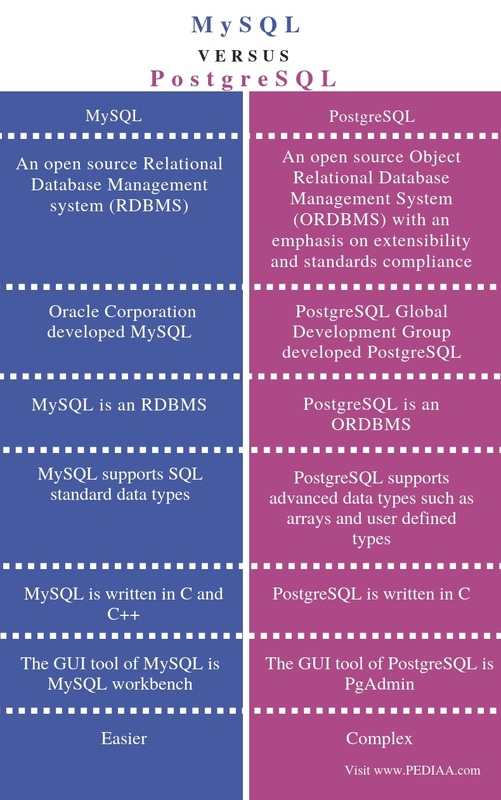 A major difference between MySQL and PostgreSQL is that the MySQL is an RDBMS while PostgreSQL is an ORDBMS. Moreover, MySQL supports SQL standard data types, but PostgreSQL supports advanced data types such as arrays and user-defined types. While MySQL is written in C and C++, PostgreSQL is written in C. Hence, this is another difference between MySQL and PostgreSQL. Furthermore, the GUI tool of MySQL is MySQL workbench whereas the GUI tool of PostgreSQL is PgAdmin. Also, another difference between MySQL and PostgreSQL is that the latter is more complex than the former. MySQL and PostgreSQL are popular DBMSs. The main difference between MySQL and PostgreSQL is that, MySQL is an open source RDBMS while PostgreSQL is an open source ORDBMS. We can also consider PostgreSQL as an RDBMS too. 1.“Learn MySQL Tutorial – Javatpoint.” Www.javatpoint.com, Available here. 2.“PostgreSQL.” Wikipedia, Wikimedia Foundation, 17 Mar. 2019, Available here.